Today, we are bringing you the best home made costume sites on the web! In our home, we love purchasing cute costumes. But what is more fun is making a costume. I am not a seamstress, so the costumes NEED to be easy and fun to make, and at the same time look amazing! We love buying costumes in our home! My oldest has worn the dress on the right for 2 Halloweens (with 2 different costumes created), as well as to a Renaissance Festival (what the dress was originally purchased for). We love to mix and match with costumes to create the cutest and most unique costumes we can find! My oldest will be a wolf. My sister, who is now 22, wore the costume when she was in ice skating over 10 years ago. The costume is still in amazing condition and super cute! We are simply adding leggings, and a little make-up to complete the wolf look. My son will be Bobba Fett. This was a choice he made, and we did purchase his costume. My youngest will be a tutu cat . . . her two favorite things. We received her costume for review, which was posted HERE. We are adding cute tights and cat sneakers. In past years, I have created costumes from things we had around the house, especially when my oldest wanted to be something that was not available at the store. There are many places to look for costume inspiration! 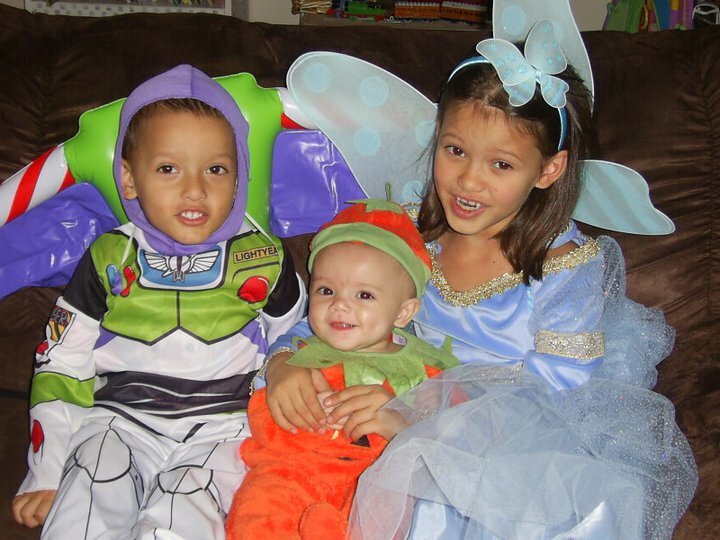 And these ADORABLE Family ideas are some of our favorites! Cute picture!! Thank you again for the awesome list of sites! So many great suggestions! I love the picture and of course I love the site. You always post the most informative information. We have a moms group that swaps costumes every year! They sure look like they are having a blast! Thanks for sharing.